These lovely Emerald lot (total of 14 pieces), 55.57 carats Coscuez mine emerald were acquired today. Just wonder at the miracle of nature. Certified I3-GIA Type 3 clarity scale these are very hard to obtain. Each piece of this lot is a unique flawless emerald! 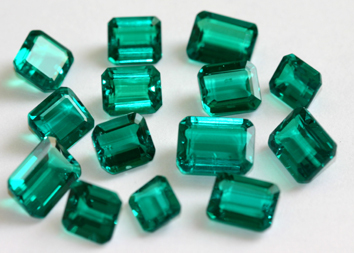 Average size per Emerald is around 3.96 carats. Top quality vivid Green color. Retail ranges from $1750 per carat to $7000 per carat. 100% no oil, no enhancement!. Patrons interested in this quality level should send us a mail directly. Such gemstones are available. Pure, rare and untreated is what makes them so special. Hold them in your hand and you will be left mesmerized.